In my first few attempts to replicate Gene’s recipe, I experimented preparing the fish with canned diced tomatoes and ketchup. It didn’t achieve the flavors I remembered. Ketchup also has too much sugar in it so I substituted it with tomato paste. Next, I exchanged canned tomatoes for fresh tomatoes. The Jersey shore has lots of wonderful fresh tomatoes in the summer so I suspect Gene used fresh tomatoes. I also replaced the aluminum foil with parchment paper. The foil can react to and possibly impact the flavor of acidic ingredients, such as tomatoes, white wine and lemon juice. Although my tongue cannot confirm for sure if I replicated the flavors from 30 years ago, I think it’s fairly close. With every bite, I am brought back to that evening, at the Jersey shore with Gene and Barbara Cohen, who introduced me to new foods when I was a child and who were great family friends. No carp in the bathtub here, only cod in parchment. Inspect the fish for bones. I keep a tweezer in the kitchen specifically for removing small fish bones. After removing any bones, rinse the fish and pat it dry with paper towels. The fish should be dry to absorb all the great flavors you will be adding to it later. Set the fish aside. The fish should be covered and returned to the refrigerator if you have not prepared all the vegetables in advance. 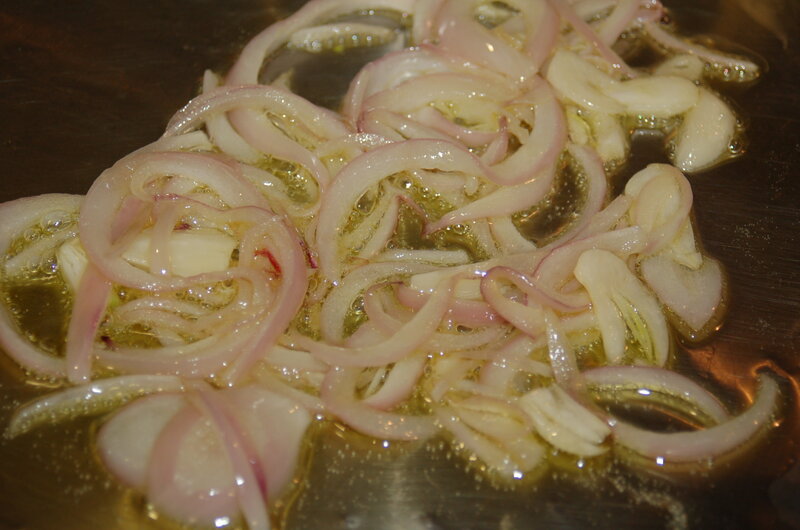 In a fry pan over medium heat, sauté sliced red onion and sliced garlic in 1/4 cup of olive oil until tender and fragrant. 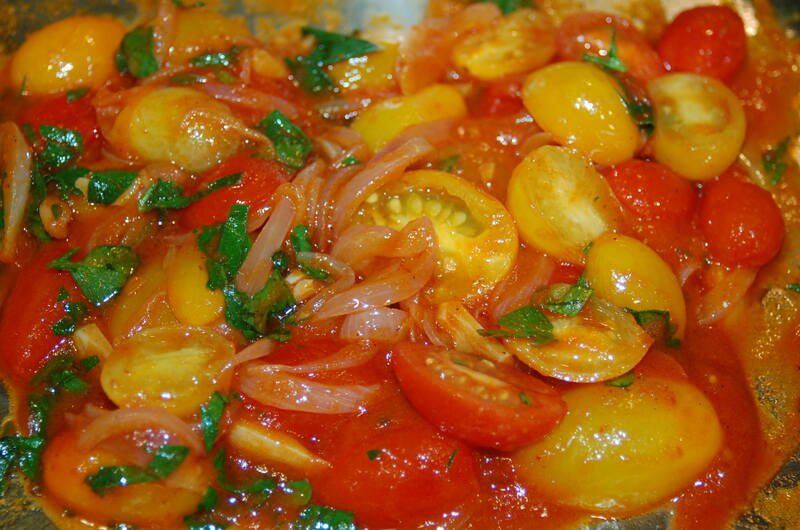 Stir together tomato paste and white wine, then add the mixture to the onion and garlic. 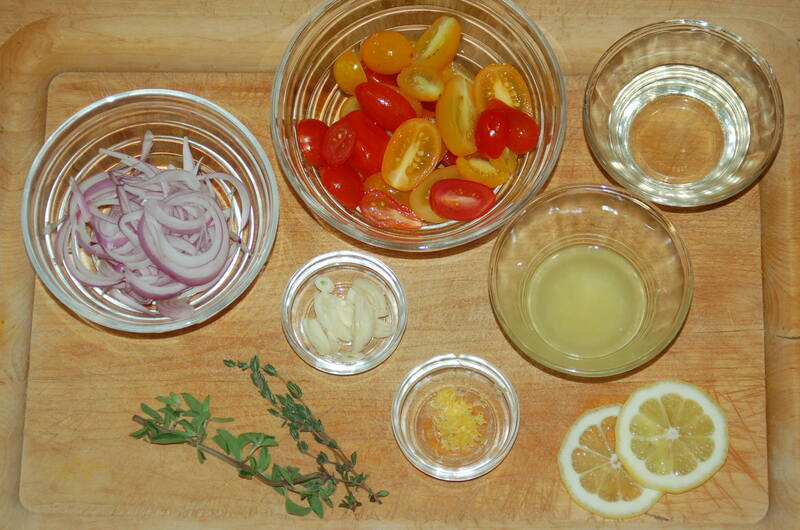 Add the tomatoes and lemon zest. Season with salt and pepper, then continue to sauté for 5 minutes or until sauce thickens. Stir in the fresh parsley, then remove it from the heat and set aside. 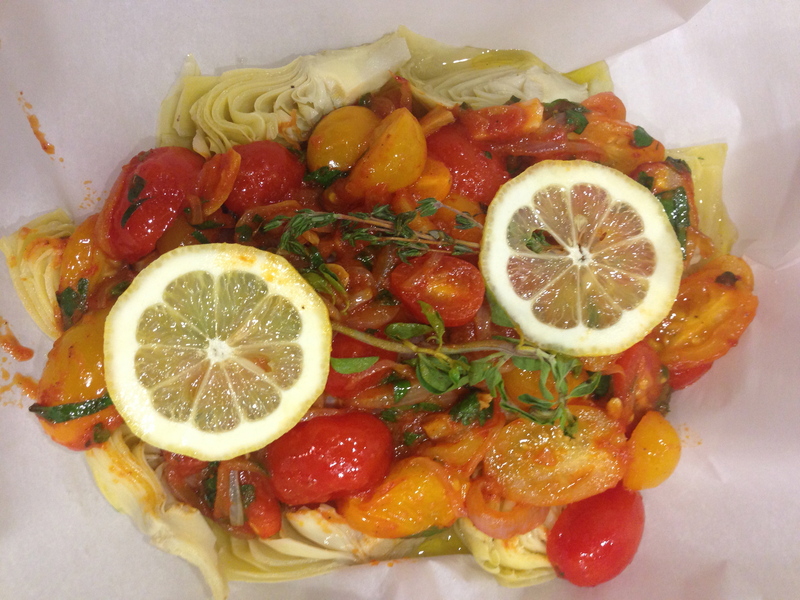 Tear off two generous pieces of parchment paper large enough to wrap the fish with the tomatoes, onion and artichokes. 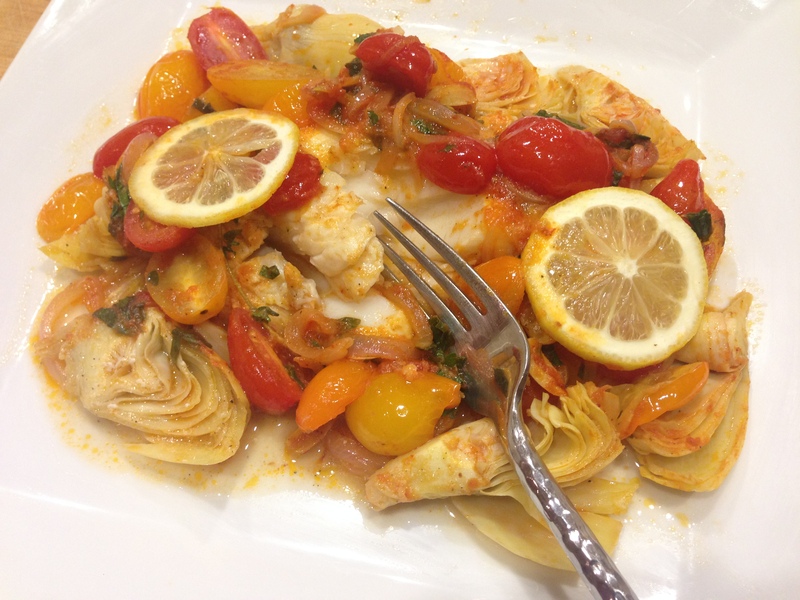 To prepare the parchment packets, place one tablespoon of olive oil in the middle of each piece of parchment paper, then place the fish on top of the olive oil. 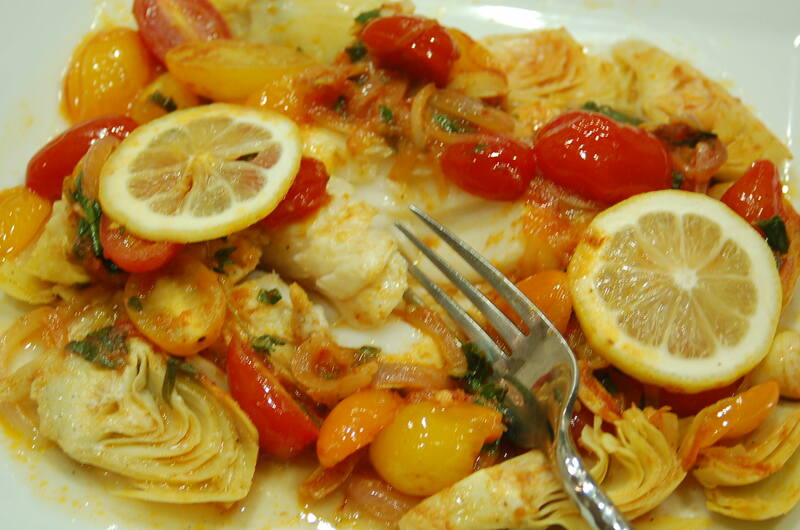 Spoon another tablespoon of olive oil on top of the fish and pour 1/4 cup lemon juice on top of each fish fillet. Season the fish well with salt and pepper. Next, place one sprig of thyme and one sprig of oregano on top of each fish fillet. 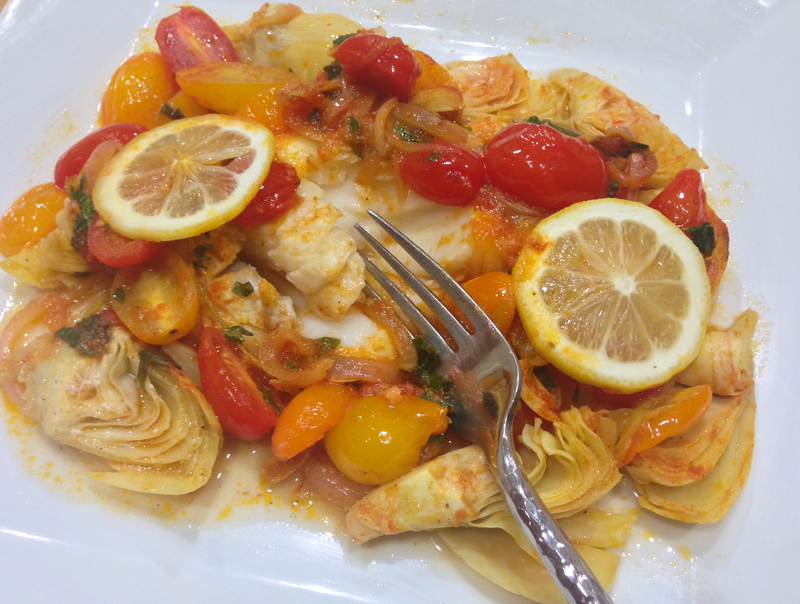 Place 1/2 cup of artichokes around each fish. 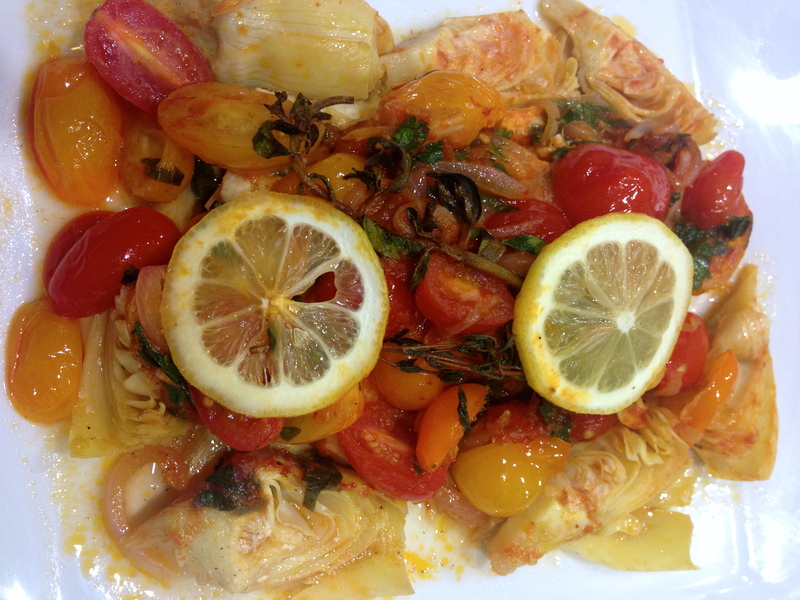 Finally, spoon the tomato mixture on top of the fish and artichokes. Be careful not to cover the thyme and oregano. This ensures you and your dinner guest will be able to see the herbs and put them on the side of the plate. Nobody really wants to eat whole sprig of thyme or oregano. 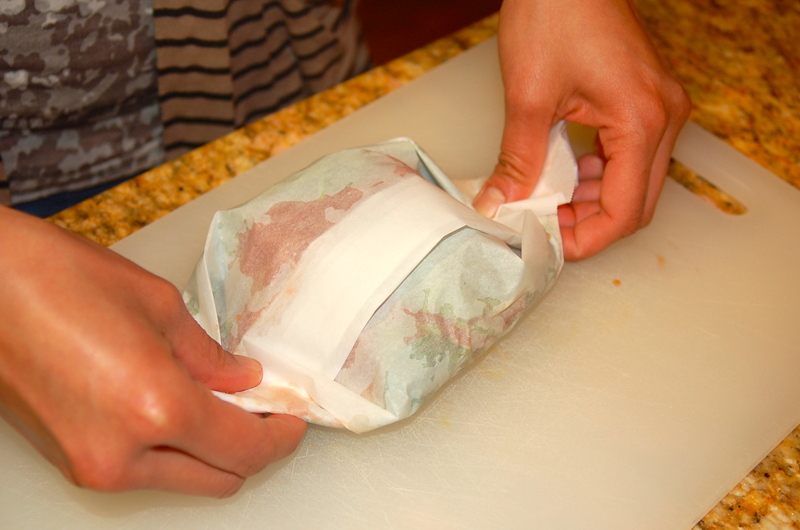 Wrap the parchment paper around the fish and ensure the edges are enclosed tightly. Here’s a video demonstrating how to wrap the fish the proper French way: http://www.finecooking.com/videos/fish-in-parchment.aspx . This method ensures the steam is trapped inside the packet, however when I’m in a rush, I wrap the fish by turning the fish so it’s longest horizontally. 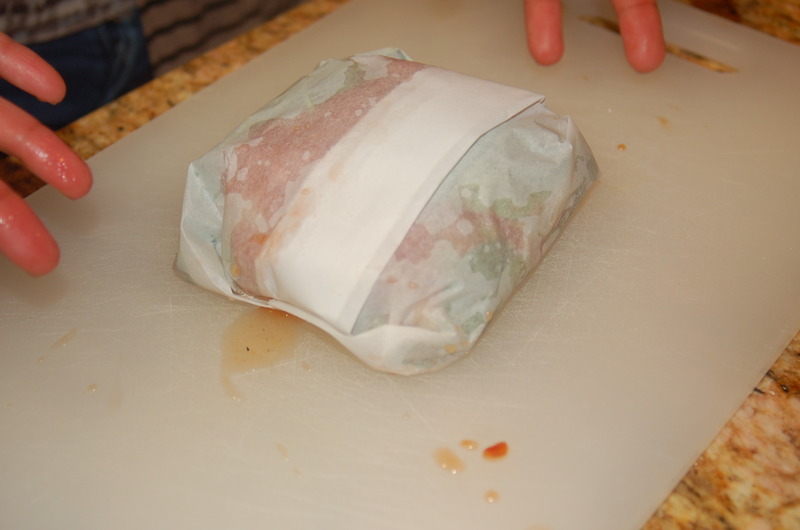 I then grab the top and bottom ends of the parchment paper and and turn over the edges over a couple of times. Just make sure to fold it tightly together. Next I fold the long ends in, forming a triangle, like wrapping a present. Lastly, I tuck in the triangle ends under the fish. Bake for 15 minutes or more depending on the thickness of the fish. You can serve the fish in the parchment packet. 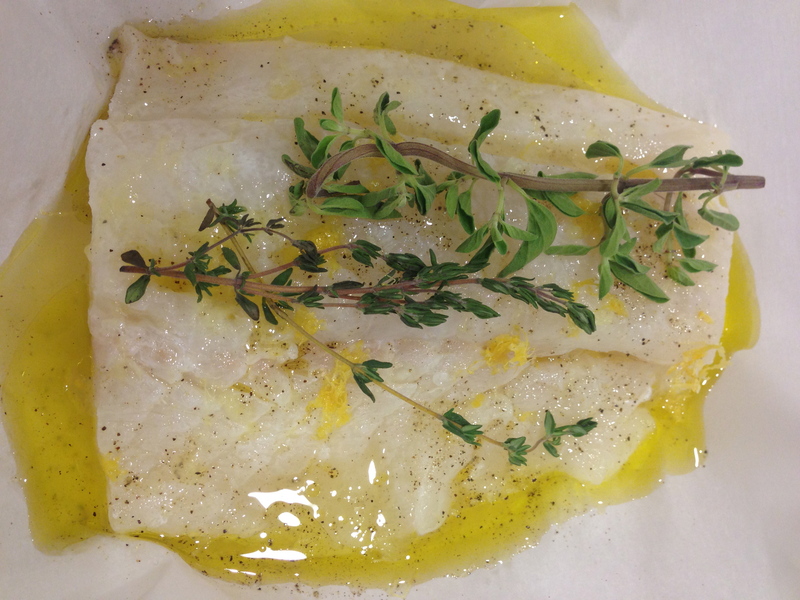 Just cut a slit down the top of the paper to reveal the fish or you can carefully remove it from the parchment paper. Remember to tell your dinner guests to remove the sprigs of thyme and oregano. Serve with brown rice or a Greek salad.